Mission: The goal was to arrive at a solution in which way the user can register their working hours via a calendar software for time registration. According to the guidelines I received from the client it would be different type of data that will be registered on different days, and not only working hours but also holidays, etc. 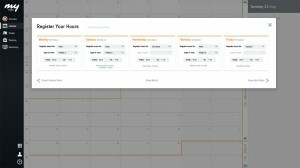 I proposed a solution in which a modal window will be opened when the user clicks on any day of the calendar or box on the left side that indicate the week. My suggestion was appreciated by the customer.